BOSTON (WPVI) -- Stephen Heasley and Andrew Borg were excited to see the wedding programs they ordered for their big day. But when the package arrived, the gay couple was horrified to instead find religious pamphlets with messages about temptation and sin, according to a federal lawsuit against printing company Vistaprint. The lawsuit, which was filed Tuesday in Massachusetts, accuses Vistaprint of attacking the couple because they're gay by replacing their wedding program order with the "hateful, discriminatory" pamphlets. "Our goal is to hold Vistaprint accountable for the harm they have caused, to give a voice to others who may have been similarly victimized, to help prevent this from happening to someone else and to send a message that there will be consequences for acts of hate perpetrated against others," the couple, who got married in Butler, Pennsylvania in September, said in a statement. Vistaprint's CEO and founder said in a letter to customers on Wednesday that it is "incredibly saddened" by the incident and has launched an investigation to determine how and why the couple received the materials. The Dutch company, which has a regional headquarters in Massachusetts, says it has reached out to the couple, who lives in Australia, and hopes to use the incident as an "opportunity to shine light on important LGBTQ issues." "We share in this couple's outrage. Vistaprint in no way condones - and does not tolerate - discrimination against any of our customers based on their race, religion, gender or sexual orientation," CEO Trynka Shineman and Founder Robert Keane said in the letter. Vistaprint later updated the letter to say it had learned that "materials that were intended to be printed for one customer were incorrectly sent to this couple" by a third-party partner. "We, and our partner, are committed to understanding how and why this happened, Shineman and Keane said. "If we determine that any individual played a deliberate role in this mix up, we will take strong action." 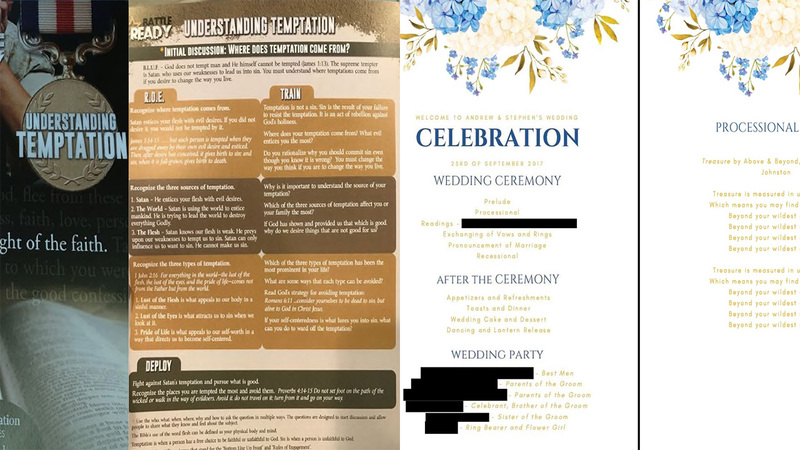 The lawsuit says the pamphlets received by the couple on the eve of their wedding included phrases such as "fight against Satan's temptation and pursue what is good" and "do not set on the path of the wicked or walk in the way of evildoers." The couple says the pamphlets were designed to intimidate and threaten them. David Gottlieb, an attorney for the couple, said they did not complain to Vistaprint at the time of their wedding because they had to scramble to print their own programs in time for the ceremony. Gottlieb said they hope that their lawsuit will bring public attention to the issue to ensure others don't receive the same treatment. The lawsuit, which seeks unspecified damages, accuses Vistaprint of discriminating against the couple because they're gay and breaching a contract for not delivering the programs they ordered.